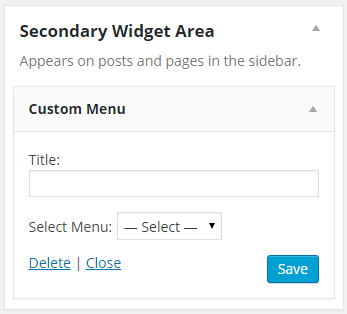 Four years ago, I wrote a tutorial about using custom menus in WordPress. 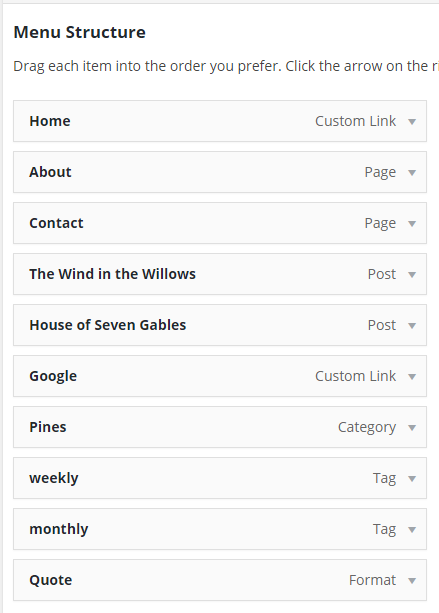 Things have moved on in WordPress, so rather than update the old post, I decided to rewrite it. 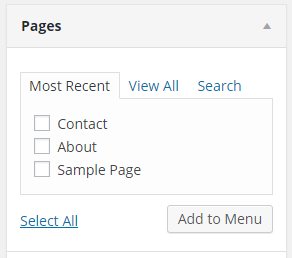 In many themes, a “default menu” of your pages will show up somewhere around the top of your website. Depending on the menu’s functions, you may or may not have any control over how these pages appear and parent pages may not show child pages as a drop-down. To make things more clear, I’ve used screen shots from this from the TwentyFifteen theme to demonstrate the steps involved. Where Else Can You Use a Custom Menu? That’s it! You’ve now created your first custom menu. Of course, it doesn’t contain any items. We’ll do that next. Now, go back to the first set of boxes mentioned in this section. These are where we will add items to our custom menu. 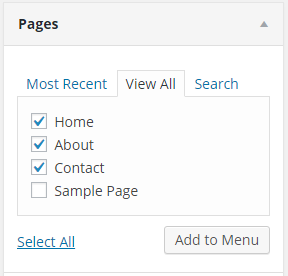 The first option allows us to add pages to our custom menu. In general, it is open by default, although I closed it by clicking on the triangle in the above screenshot. 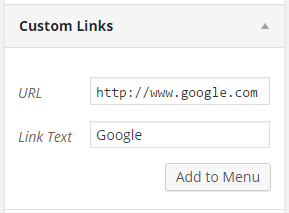 After you’ve specified the URL (don’t forget the “http://” part) and the Link Text (which is what readers will see in the custom menu), click on the “Add to Menu” button. 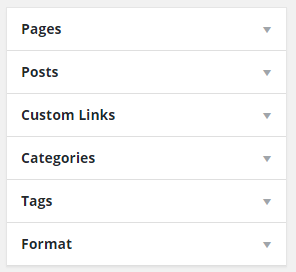 Note: You can add as many custom links as you want, but unlike Pages and Posts, you need to add them one at a time. 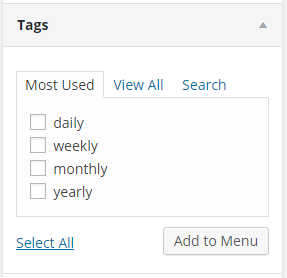 Similar to the options for posts and pages, the categories and tags option default to “Most Used”. 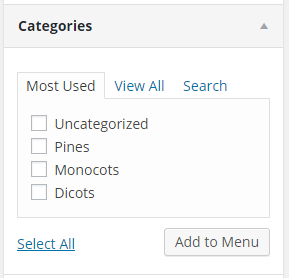 You can click on “View All” to see all the categories or tags, or click on “Search” to find a particular one. Again, once you finish, click on “Add to Menu”. Not all themes support all these posts formats, however. 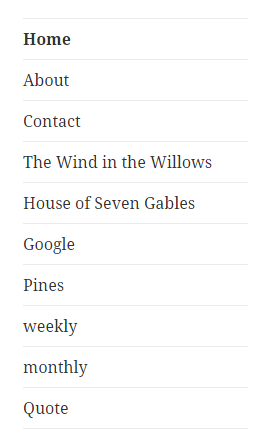 If your theme does, and you use them, you can use this option to link to an archive of the posts that have that particular format. I said earlier that you can only use a custom menu if your theme supports it. The good news is that most modern WordPress themes do support custom menus. How many they support and where they place theme vary quite widely from theme to theme, however. The “Theme locations” option tell you where your theme supports a custom menu. In this case, the TwentyFifteen theme supports two custom menus. Click the “Primary Menu” option and then the “Save Menu” option to have TwentyFifteen display your custom menu as its primary menu on the left side. This is especially useful if there is a group of posts or pages that you want to highlight. 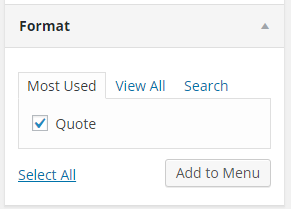 A common issue with custom menus is how to create a menu element that isn’t linked to anything. I’ve actually written about that here. 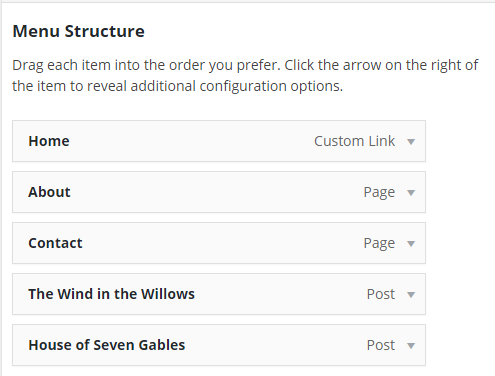 For better or for worse, the powers that be at WordPress have decided that most customization options should be handled through the Theme Customizer. (There has been much gnashing of teeth over this decision, but I’m starting to think it’s a good one—unless you have a small monitor.) In fact, if you look at the first image in this post, you’ll notice an option to “Manage in Customizer”. For the time being, Custom Menus in the Theme Customizer work pretty much the way I’ve outlined above. You can perform all the functions I’ve outlined above, but instead, you can see your results live. 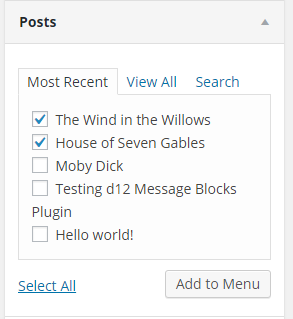 It’s pretty nifty actually, and reduces the learning curve for WordPress quite a bit. 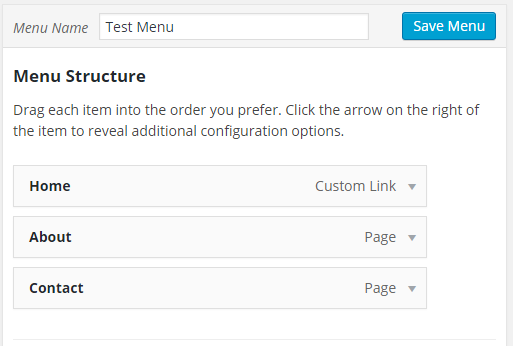 Custom menus are a powerful tool for customizing your WordPress site. 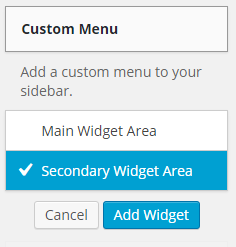 If your theme doesn’t support custom menus, it’s time to find one that does. And once you have a theme that supports custom menus, be sure to use them. Questions? Thoughts? Feel free to comment below. This was so helpful! Thanks so much!! Wow, you really saved my day (and probably my relationships :P) Thank you for rewriting this guide!!!! I do have a question though; do you know if it is possible to make the pages ‘un-clickable’? Racking my brain on this one …thanks for the heads-up on sub-menus. I can’t believe it was so easy. 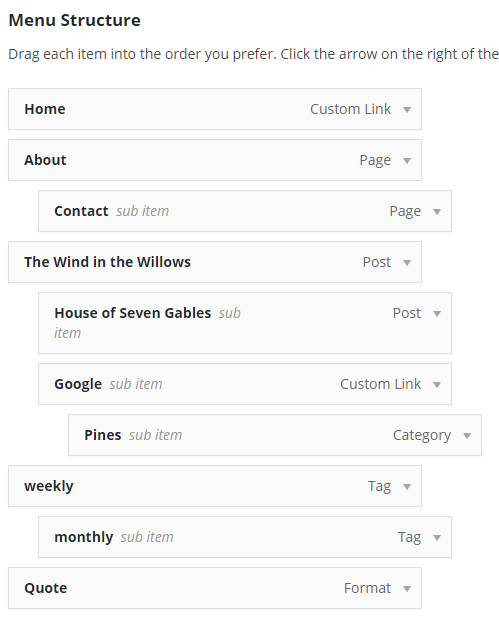 How to vertically align the new sub items? Do you mean on the front end of your site? If so, they are vertically aligned via CSS. Unfortunately, I can’t provide much help here, as each theme styles menus differently. Try using your browser’s “Inspect” function (F12 or right-click on an item, usually) to see which CSS classes and/or ID’s are affecting the menu item spacing. If I want to change my menu can I create a new menu based on the old menu but not make it “live” unitl I have it right? Yes. You can have a lot of different custom menus, but only those that are assigned to a location will be seen. Thank you very much, you are a lifesaver. I can’t believe that it’s so simply, yet I’ve lost so many hours of sleep trying to figure it out! How do create megamenu custom? Thank you so much. After an hour of trying to figure it out on my own your tutorial gave me the info I needed in a couple of minutes. You’re welcome. I’m glad it saved you some time. Thank you SO much for this post! It was so easy to follow and straightforward. You’re welcome. I’m glad you found it easy to follow. Thanks for a very complete tutorial. 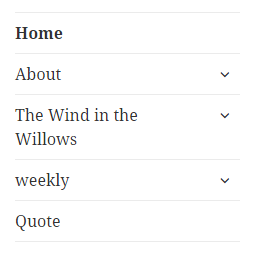 I created a custom menu item in which I want to function as a label only, so I deleted the URL from that item, but it still shows a different color on mouse-over as if it was a link. How do I disable that hover effect from that item? When creating a custom link to a PDF, how do you indicate that it should open in a new window? The target is an option in general but not with custom links as far as I can tell. That’s a really good question! There’s no way to do that in the default custom menu options. It’s possible that there is a plugin that will handle that function, but I’m not aware of one. If I find one, I’ll definitely post a link. I’m not quite sure what you’re after here. Do you mean you want a button in a menu? Is there a web site somewhere that has the kind of function you’re looking for that you can point me to as an example? Sorry it took me a while to reply; work and health issues. how can i remove dropdown menu and freez its submenu? I’m trying to apply this to a page that is not the home page, but can’t figure it out. My new menu shows up when I click on navigation but on the HOME page. My theme allows two menus. Sorry for the delay in getting back to you; my email has been dodgy lately. Have you managed to get this sorted?